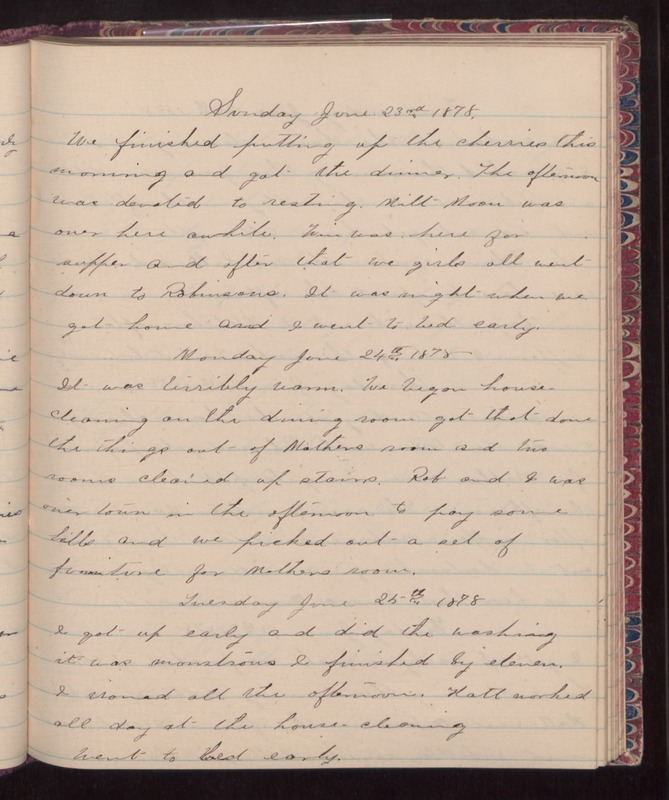 Sunday June 23rd 1878 We finished putting up the cherries this morning and got the dinner. The afternoon was devoted to resting. Milt Moon was over here awhile. Wins was here for supper and after that we girls all went down to Robinsons. It was night when we got home and I went to bed early. Monday June 24th 1878 It was terribly warm. We began house-cleaning on the dining room got that done the things out of Mothers room and two rooms cleaned up stairs. Rob and I was over town in the afternoon to pay some bills and we picked out a set of furniture for Mothers room. Tuesday June 25th 1878 I got up early and did the washing it was monstrous I finished by eleven. I ironed all the afternoon. Hatt worked all day at the house-cleaning. Went to bed early.